The story of John Cooper’s career is one of consistency and longevity. His consistency was highlighted in 1997 when he became the record run scorer in the history of the Huddersfield League, passing the 16,042 runs scored by John Shaw. His longevity can be measured by the fact that he played for 37 seasons at Golcar without letting his performance levels dip. Cooper describes himself as “a determined batsman equipped with a good defence and strong powers of concentration”. He had a tendency to swish outside off stump occasionally but his regular presence on the Golcar website’s centuries list proves that he was able to play the long innings. Cricket ran in the family and John started playing the game from an early age. 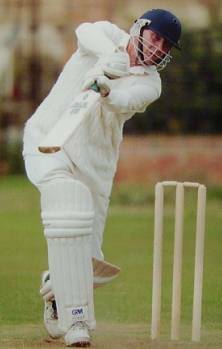 Encouraged by his father and three uncles, all of whom played club cricket in Worcestershire, he started playing cricket at junior school level and then latterly at King Charles I Grammar School. Cooper made his debut for Golcar in 1968 at the age of 22 after playing in Worcestershire. Upon arrival at Golcar, he came across sledging for the first time. “Sledging was news to me when I first came to Yorkshire. It has continued all the time. The best advice is to smile and ignore it”. His highest score of 134 against Paddock was accumulated in difficult early-season conditions and Cooper remarked that “it was one of the few centuries that were scored in the Huddersfield League before Easter”. As well as being a prolific batsman, Cooper was also an astute captain of the club and a very committed fielder. He would take up any position that his team needed him to. He was at his best when close to the bat and often fielded in the slips or in the gully region. He also deputised as wicketkeeper when cover was needed and was an occasional bowler who could often chip in with bonus wickets. Over the course of his 37-season career, Cooper witnessed many changes at Golcar. The club unveiled new changing facilities and a new scorebox at the start of the 2005 season. He also says conditions have got better for cricket: “The wickets at Golcar have improved with the introduction of covers”. He also pointed out that “fewer people turn out to watch village cricket nowadays”. As well as seeing significant changes at Golcar, changes have also been seen in the way that local cricket is run. The Huddersfield League switched from 45 overs to 50 over cricket in the latter part of his career and as with the international game run rates have increased. In recent times Cooper has also noticed that money has become an increasingly important factor in the local game. He says that, “clubs with healthy finances have been able to attract players from other clubs and be successful; clubs with limited resources are likely to collapse eventually”. John Cooper has played with and against many famous names among the local cricketing fraternity. He rates Brian Turner, Sanjeev Sharma, Arnie Sidebottom and Atul Bedade as the best players that he has played with. Of the players that he has played against, he picks out Sylvester Clarke, Darren Gough, Ronnie Irani, Allan Lamb and Dulip Doshi as the players that stand out. Cooper’s secret to playing for so long was “to enjoy his cricket and keep practising” and his 37-season career came to an end when he retired in 2004. In his last season at the club he helped Golcar to gain promotion into Section ‘A’ of the Huddersfield League as they won the Cedar Court Conference Championship. It was the first time the club had reached such heights since 1993. He rates this promotion among the highlights of his time at Golcar. He also cites the fact that he has made so many friends in the game as one of the reasons that he has enjoyed playing for so long. Outside of playing, he also has a cricket coaching badge. When asked about who his cricketing hero was, Cooper said: “I was inspired by all good performances and I didn’t have a particular cricketing hero”. When his career at Golcar ended, the club had lost one of its greatest batsmen. A prolific run scorer for almost four decades, he also turned out for Worcestershire’s 2nd XI, opening the batting with Duncan Fearnley, who is now renowned for bat manufacturing. He has another claim to fame: as a teacher he helped to discover Clare Taylor, who went on to play cricket and football for England. Since his retirement in 2004, John Cooper has become a Trustee of Golcar Cricket Club and is also a member of the committee. His picture hangs proudly in the clubhouse at Swallow Lane and he will be remembered as one of the club’s greatest stalwarts.